The Pension Protection Fund produces a monthly index update (this month’s release has data taken as at end-May 2012) of the estimated funding position of the defined benefit schemes which would be potentially eligible for entry into the Fund. 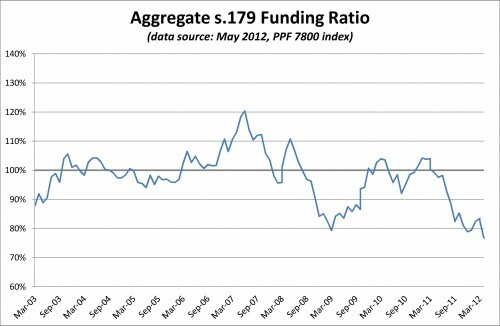 The aggregate funding level has now set a historic low since PPF records started in 2003. Unsurprisingly, the move in funding was dominated by the shift in assessed current liability levels with 20yr conventional gilt yields falling almost 40bp over the month. 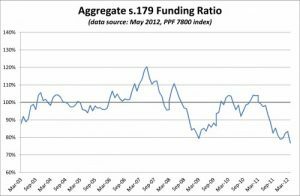 This trend has also continued for June month to date, so we expect another drop in aggregate funding levels next month.